It has been quite a while now since my last post… and even longer than that since my postings were actually regular. Lots of reasons for that, some more interesting than others. Long story short, I haven’t had the time to blog as much as I would have liked, but it doesn’t mean I’ve stopped creating. While the comic strips have been on hiatus, I’ve still been stockpiling ideas and also drawing lots of other things. Shortly I hope to begin catching up on a lot of old art from the last several months so you can see what I’ve been up to during my semi-absence. I may also have some bits of interesting news to share as well… and when I’m ready to be more regular again, the comics will come back. I still have wacky Fringe Kisses ideas, want to revisit the From Where I Sit folks, and definitely need to get back to the story of Buzz and the gang in ‘Sects! Thanks to those who have been sticking with me… and especially those of you who have checked-in to see what was up with the lack of updates! I hope to be back in the regular posting game soon… Stay tuned! Over the weekend I prepared the above simple animation, knowing the milestone would probably happen early this week. Truth be told, this probably would have happened in January but the combination of illnesses and some Internet outages took away from my normal stream of visitors. I didn’t lose any followers (thank you all!) during those times but I did obviously lose hits those days when I hadn’t posted new nonsense. I’ve continued the tradition of building upon the first animation I made when I hit the 10,000 hit milestone… then again at 20,000. Will I keep doing this? Who knows. I kind of like keeping the aspect of where-I-came-from by continually building on what came before for each new milestone. As promised when I returned from my week-long absence due to illness and lack of Internet… I’ve been catching up and trying not to flood too much in the process. All the episodes of ‘Sects from the past week or so are up now, but all were retro-posted. This means that they were back-dated to make it easier for finding them in the archives, but harder to find as new posts for my followers who just use their WordPress Reader. Ah… remember back when I used to post most every day… that comic strip ‘Sects and other such things? Yeah… me too. Good times… good times! A perfect storm of nastiness… I was fighting a nasty cold, lots of congestion and other generally non-fun things for a week or so but was finally looking like I was about to turn a corner by the weekend, but then Sunday I entered a hurling contest of the worst kind (think about it) and I won! Or I lost… cookies were tossed. I’ve been on another slow mend this week to recover from that! But, that’s not why there have been no cartoons. The only day I actually didn’t feel like drawing was Sunday. I was in a bad way that day… then slept most of Monday but at least wasn’t sick, just weak and back to cartoons. So, Sunday is skipped with no return… but I’ve been doing all the others, since last week. The reason I couldn’t post… is because I also lost Internet sometime late Tuesday night of last week. So I couldn’t tell people I was sick or post anything or argue with people on the Internet about politics or religion! 🙂 The humanity! But I’m back… and tonight I’m going to be retro-loading last week’s cartoons. That means Wednesday, Thursday, and Friday episodes of ‘Sects from last week will be going up shortly but they will be going up as if they were posted on their proper dates, thereby making it easier for people to find them via search and by the calendar. Tomorrow I will post some more from this week, and hopefully be caught up by the weekend so I can post Sunday on schedule and be back on track. Once I am back on track, I will post a link post that contains links to all the ones I’ve retro-posted so that if you are a follower who just checks your WordPress Reader you can use that to more easily find all the ones you missed. So, yeah… it’s been a couple of weeks, give or take. Sadly it also meant I missed celebrating the two-year anniversary of ‘Sects too! But… I’ve been sick for the last couple of weeks. Just when I thought I was getting out, it pulled me back in again! Some unknown virus, maybe the flu, made me an offer I wanted to refuse… but alas, could not… which meant chaos for the blog. But… hopefully I can get back on track. I have a backlog of stuff I’ve drawn and haven’t gotten around to posting. I’m also starting up the ‘Sects comic strip again. I’ve got a lot of good skipped days to fill with backstory one of these days when I get the time, and I have some cool ideas about how to do that in a creative and hopefully entertaining way… but for now, back to the funny… and hopefully no skipping days for a while! So… anyone new to the blog over the last week has found a ghost town, lacking only tumbleweeds to seal the deal. I hope I haven’t missed out on any new followers as a result! Regulars have probably wondered just what the heck happened. Well, to make a long story short, I’ve been without Internet since last Friday… so for the past seven days roughly it was not possible for me to check emails or post to the blog or do any number of other things I wanted to do. To make things easier for future followers and to make it easier to re-read old episodes, I am going to back-date all the posts of ‘Sects episodes so that they appear to have been posted on the regularly scheduled dates. They will be in order, and if you visit the blog it’s no big deal… but if you’re using the WordPress Reader then it means you’ll have to scroll back in time to see them. To help out a bit, once I’ve posted all the missed episodes for the past week, I will come back and edit this post and add active links to each day’s episode to make it easier for you to find them. On the plus side, I think I did some funny bits while unable to post… and I’ve got a bunch of other drawings to post as well that I hope you’ll like. Thanks to everyone for sticking with me, sorry for the temporary absence, and I hope these will all be worth the wait! I did some math earlier in the week and realized that my 800th post was going to happen over the weekend. I had some choice as to what to actually post as number 800, but decided to go ahead and let the 800th post be about various milestones happening this month. Tomorrow (July 25th) is also the two year anniversary of starting this blog. If you’re at all curious, go take a look at the very first post (appropriately an early comic strip) I made on the blog way back on July 25th, 2014. A milestone that occurred earlier this week… ‘Sects had its 500th episode! I also realized counting the ‘Sects milestones are tricky. I have skipped some days here and there, and that’s easy enough to keep track of… but there was also one day last year when I actually posted two episodes in the same day! So… the 500th new episode was posted on Wednesday this past week… but the 500th day of unique episodes actually happened on Thursday. An honorary mention is the hit counter… I’m just under 24,500 hits on the blog in two years. It has been a slow uphill climb, gaining followers and regular visits over the years. I’ve definitely got a strong loyal following now, but I’m always hoping to expand… hence why I gave up the ghost and joined Facebook last year to provide additional promotion for my work. Thank you to everyone who has been here for the long haul… thank you also to all the newly following! I hope I continue to create things that engage you in some manner, whether it be in quality of the art or the silliness of the idea. Please, if you really enjoy any of the things I do here, tell your friends and let’s see how much we can blow this thing up for year three! I have an idea for a thing… that I will not get into right now… but something I wanted to do was use some inspired-by-real-life local locations with this. Given what I know and what you do not know, the place to start was with an old comic book store. 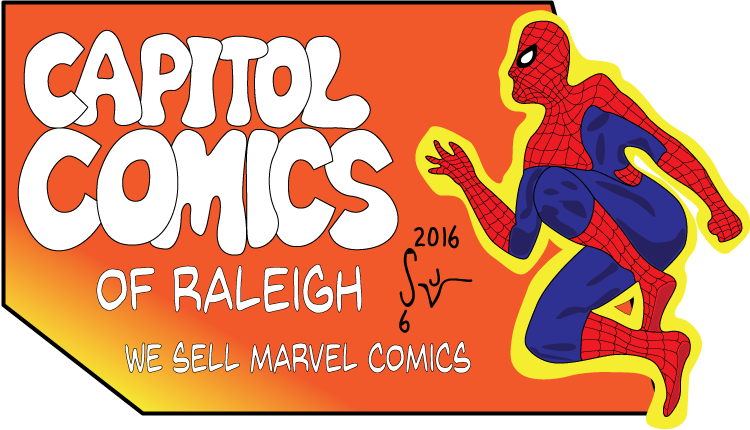 Capitol Comics of Raleigh, NC, opened back in 1986 on Hillsborough St in downtown Raleigh, NC. Many years later they opened another location out past Crabtree Valley Mall, but a few years back they closed the original location and consolidated to just the newer one. Sadly even the building where the original location opened no longer exists! I worked at the original store location many years ago, and the owner Ken Pleasant has always been a class guy. I’ve also met and worked with lots of good people that I met through the years working and shopping at Capitol Comics. 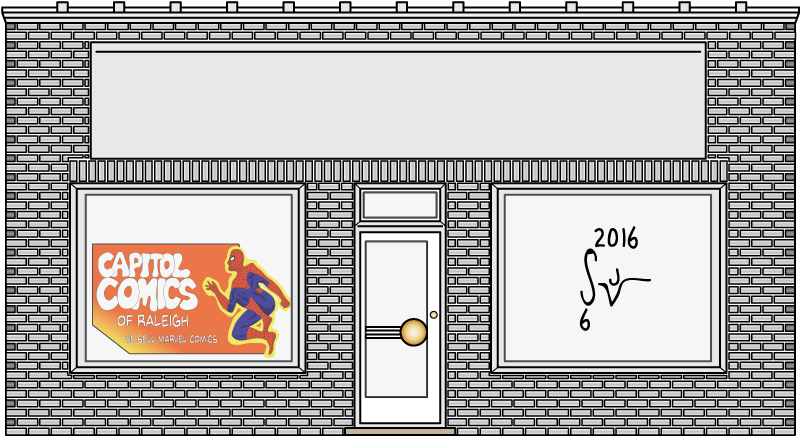 I don’t want to say too much about my eventual plans for all this… but it could involve some further decorating of the insides of the store (as seen through the windows) and some looks at the interior as well. Stay tuned! I’m hoping to keep a sliver of the past alive through the creation of a whole ‘nother thing as I get the time to work on it. Please let me know what you think (especially if you’re local to Raleigh, NC and are familiar with this store) and remember, if you’d like an original commission by me or would like to hire me as an Illustrator, please use the Contact page and let me know as much as you can about your request. Eagle-eyed observers, folks who aren’t easily fooled, and basically anyone who pays attention will note that there was no new ‘Sects episode this Sunday. Chalk it up to a need to catch up on some sleep and a decision to not force-feed creativity just to make Sunday happen. But, because of that… I’ll give you a sneak peak at a little bit of process stuff to semi-make-up for that. Early on, I knew I was going to be re-using stuff in my digital Web comic. That’s part of the beauty of it… draw some good backgrounds and stuff once and you get to re-use them. It also allowed me to start with sparse backgrounds in the beginning only to build brick walls and other things over time into the backgrounds and have a bit more complexity while not driving myself nuts in the early days! 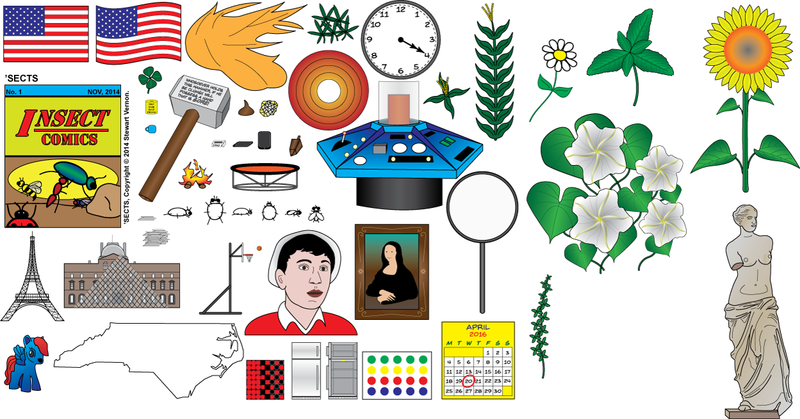 If you look closely, there’s a couple of things that haven’t yet been used… Spoilers! Eventually I hope to go back and scavenge all my objects and all of my different backgrounds as well. My characters are mostly all together, but some of Buzz‘s special costumes/disguises are all over the place right now and I need to organize all of those as well. Anyway, just a peak into the madness of my mind to make up for the lack of ‘Sects this weekend.